If you’re wondering what this post is about, we’ve decided to start a series of blog posts showcasing the “one good thing,” of the successes our members have highlighted for the week. There can be challenges throughout our various organizations, but it’s important to recognize the positive work that is being done every day. Today’s one good thing comes from Denny Bender of Union Rescue Mission in Wichita, Kansas. Denny manages Newleaf Mercantile, an online book store that resells donated books and keeps them out of the landfills and is a program operated by the Union Rescue Mission, In turn, this service creates jobs, provides meals for those in need and offers services to those whom are houseless. 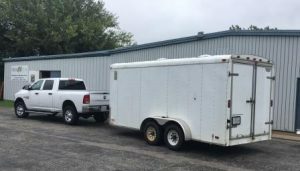 The donated pickup and trailer will be beneficial to for transporting donated goods. We celebrate your joy of a new pole barn that was built so that inventory has a big enough storage spot. More recently, URM has been working on building a mission-operated housing complex which will provide affordable housing to those graduating mission programs. Construction for this project is ahead of schedule and will welcome in mission program graduates next spring. This example highlights how one donation to a program can support the overall success and positive growth of the organization. Thank you for sharing your positive of the week with us, Denny!